At Cornerstone Christian Academy, the Christmas season is all about giving back to the community. We encourage our students to get into the spirit of Christmas by finding ways to help those who are less fortunate in the community. Below are some suggestions on things you can do during the 25 days of Christmas to enrich and bring our community closer together. 1. Create a card to send to a hospitalized child - Brighten an ill child's day by sending them a "get-well", or "thinking of you" card. You can hand deliver them to your local hospitals, or you can send them to an organization like Cards For Hospitalized Kids and they can deliver them for you. 2. Let someone go ahead of you in line - This simple act of kindness won't cost you a thing and will be so welcomed during the hustle and bustle of the holiday season. 3. Compliments Don’t Cost a Thing - For many people, gaining a bit of self-confidence can be hard. If you see someone on the street who looks a bit down, compliment them on their appearance. Your compliment may be just the thing a person needs to put a smile on their face. 4. Place Your Spare Change in Vending Machines around Campus - The fastest way to a person’s heart is through their stomach. Placing the extra change that you have in vending machines around the Cornerstone Christian Academy campus is a great way to brighten a person’s day. By doing this, you will be able to provide an unsuspecting student or a member of the staff a free drink or snack. 5. Leave a Book For Someone to Read - One of the best ways to escape from reality is by reading a good book. If you are done with a book, why not pass it along to another avid reader? Leaving your used books at libraries is a great way to offer someone a good read for free. 6. Donate Food to an Animal Shelter – It’s a good idea to call ahead to see what type of food is needed or if there are special needs, but your local shelter will be beyond grateful for this kindness project. 7. Care Packages For the Homeless - If you are looking to give back to the less fortunate, making care packages for the homeless is a great option. There are a number of homeless shelters out there who will be happy to help you give out these care packages. 8. Offer Free Babysitting - If you love kids and know someone who could use a break to do a bit of Christmas shopping, then you can offer free babysitting services. Most parents would jump at the chance to get a little interrupted shopping done. 9. Make a Meal for an Elderly Member of the Community - For some older people, the holidays can be a bit lonely. Cooking a meal and going to eat it with an elderly member of the community is a great way to spread holiday cheer. 10. Donate Food to a Local Food Bank - Providing a person in need with a great meal can be very rewarding. Taking a trip to the grocery store and buying a few bags of goodies to donate to a local food bank can provide hungry people in the community with a hearty meal. 11. Visit a Nursing Home - There are many residents of nursing homes in the Westminster, CO area who do not have a family to spend the holidays with. Going to some of the nursing homes in the area and spending time with the people is an excellent way to show them someone cares. 12. Help a Neighbor With Some Yard Work - Decembers in the Westminster, CO area is usually filled with snow. If you are out shoveling the driveway at your home and see a neighbor doing the same, why not offer them a helping hand? This act of kindness will mean more than any material gifts you could hand out. 13. Give an Elderly Loved One a Ride to the Doctor - With all of the sacrifices that most grandparents have made for their children and grandchildren, making them feel special during the holidays should be a no-brainer. Something as simple as offering to take your grandparents to a doctor’s appointment can mean so much to them. 14. Help out a Local Charity - Since Christmas time is known as the “Season of Giving”, why not give some of your time to a local charity like A Precious Child or Broomfield FISH? Most charities need a lot of help during this time of year and would love for you to lend a helping hand. 15. Pay It Forward in the Drive-Thru - Grabbing a quick bite to eat via a drive-thru is something most people do at least once a week. Next time you are in a drive-thru, pay it forward by picking up the tab for the car behind you. 16. Donate Blood - Unfortunately, the holiday season brings about an increased need for blood transfusions due to car wrecks and other accidents. Donating blood one time can help up to four patients who need a blood transfusion. 17. Bring Your Old Magazines to A Doctor’s Office Waiting Room- If you are like most people, then you probably have a lot of old magazines laying around your home. By taking the old magazines into a doctor’s office, you will be able to make the wait much more enjoyable for the patients. 18. Offer a Stranger a Helping Hand - Noticing someone who is struggling to open a door with an armful of groceries of to get a stroller over a curb is a common occurrence. Instead of turning the other way and continuing on with your day, you need to offer a stranger in need a helping hand. 19. Volunteer to Wrap Presents - One of the most time-consuming parts of gift giving is wrapping the presents. You can take the stress out of the wrapping process by offering your wrapping services for free to neighbors, co-workers or friends. 20. Make Good Use of Retail Sales - During the holidays, a variety of retail establishments will offer buy one get one free deals. Buying a product and then donating the free one to a charity can make giving back simple. 21. Feed Parking Meters at Stores in the Area - The large crowds that will be out hunting for holiday shopping deals may lead to a person getting parking tickets due to the time on the meter expiring. Why not take some of the extra change that you have and feed meters around local shopping establishments to help shoppers avoid parking tickets? 23. Give Teddy Bears to the Police Department- Donating teddy bears to the police department can help them greatly when dealing with traumatized children. These teddy bears will be given to children who need them as a means of calming them down after going through a rough experience. 24. Bake Cookies for a Local Business - Who doesn’t love a nice, hot batch of Christmas cookies. Baking a batch of cookies and taking them to one of your favorite local businesses is a great way to spread some holiday cheer. 25. Make Thank You Cards – Design and create the thank you cards you’ll write as soon as Christmas Day is over OR to have on hand for birthdays and other times a heartfelt “thank you” is needed. Now, here comes the fun DIY project part of this post. 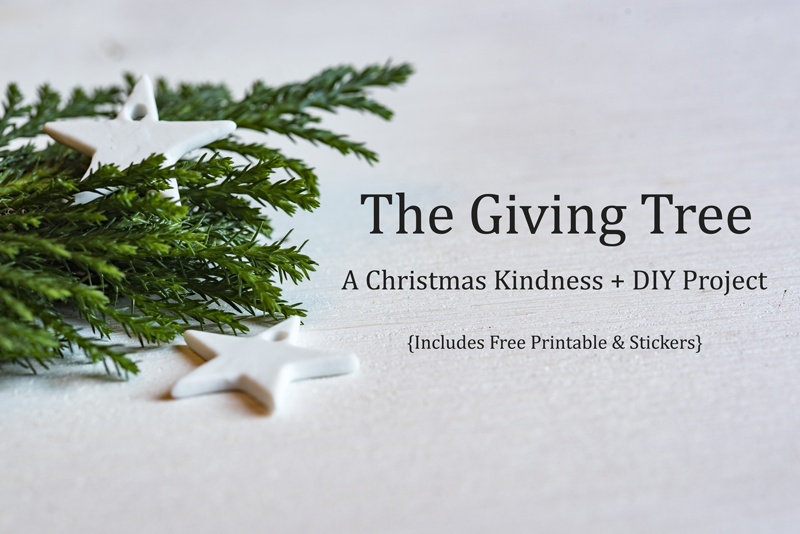 Below you'll find a download link to a free Christmas tree printable and green stickers. Post the Christmas tree somewhere central in the house so everyone can access it. Every time someone in your family performs an act of kindness you'll add a sticker to the tree. The goal is to have the entire tree covered in green by Christmas day.